We are garden fairies and we feel that it is our duty and responsibility to let people know what is really going on here at May Dreams Gardens. It is now the month of May as most people know and Carol is woefully behind on many garden tasks that should rightfully be done right now. We expect, and hope, that any day now she'll come flying through the garden gate and commence doing with what needs to be done around here. Oh, sure. She is mowing the lawn and we do appreciate that. And she did a bunch of weeding the other day. But let us tell you that we are garden fairies and we can show you a whole bunch more that should be done around here. Especially in the vegetable garden. Now some people, especially gardeners, might think that we garden fairies should take matters into our own hands and do some of the heavy lifting around the garden. We are garden fairies, and that is just not going to happen because we are busy, too. Busy? We are glad you asked. We garden fairies are busy with our flower festivals and festivities. As is well known, or maybe not well known, we garden fairies have some kind of celebration for each and every new flower in the spring. As you can imagine, having all these parties and celebrations leaves us with little time for even playing jokes on Carol. As we said, we are garden fairies and we have different parties for different flowers. 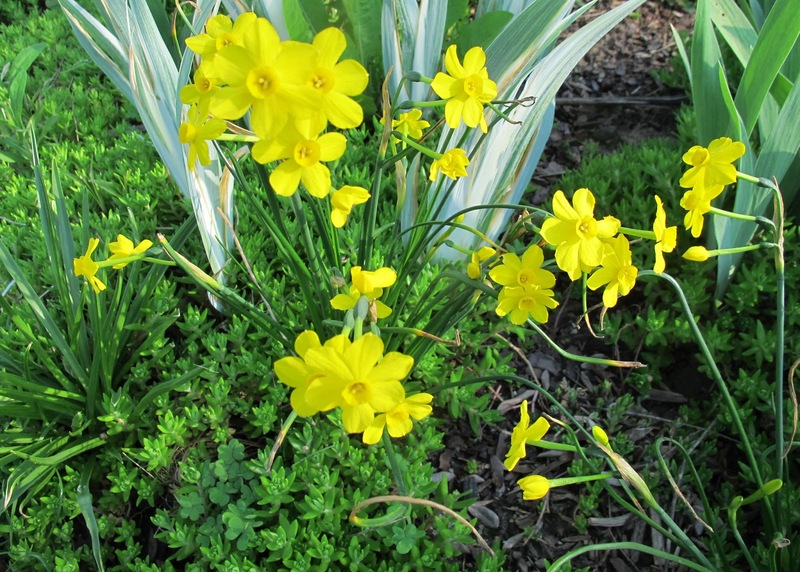 For example, for these jonquils, we usually just have an afternoon tea. 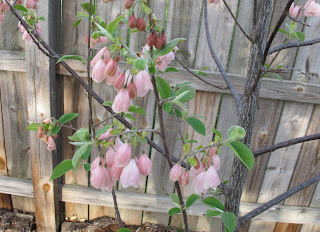 They are growing in several places, so we have more than one tea so no flower feels snubbed. We think it is very pretty and have decided that we will celebrate it with a nice luncheon. 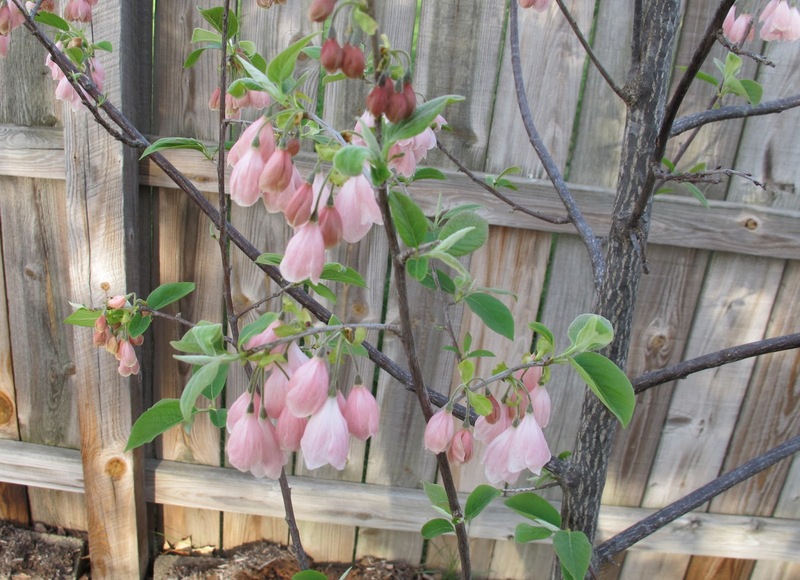 We are still deciding how to celebrate the blooms of the Carolina Silverbell, Halesia carolina 'Arnold Pink'. We are thinking it is so very nice that we will have a special brunch in its honor. The oldest flowering tree here in the garden is a crabapple, Malus 'Guinevere'. 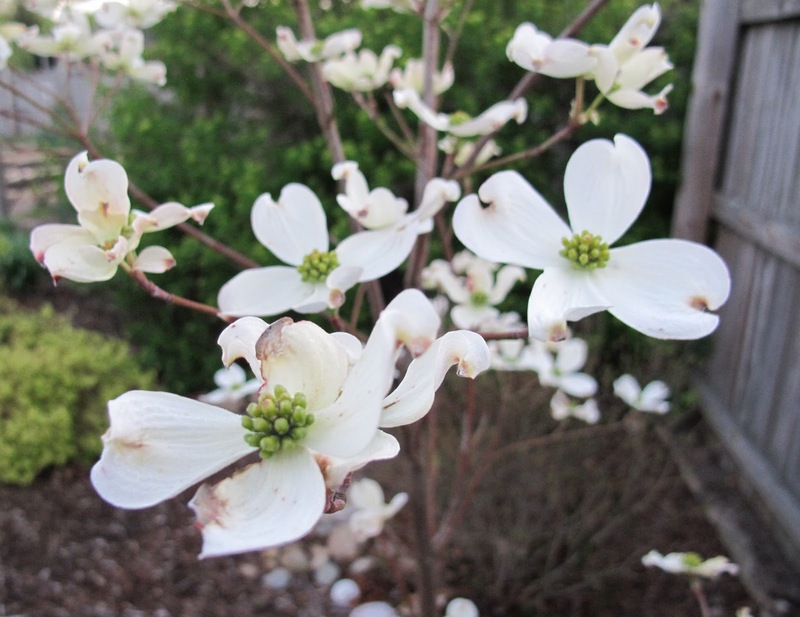 We have a big, all night blow-out of a party when this tree blooms. 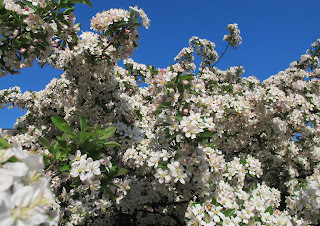 We gather underneath it and, well, we are garden fairies, we are not going to tell everything that goes on under the crabapple tree, especially when the flower petals cover the ground. 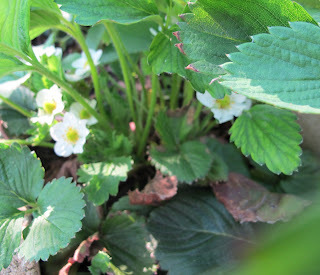 Out in the vegetable garden, our friends the McGarden family celebrate each new bloom, including these strawberry blossoms, which we think seem early but maybe not. Granny Gus McGarden and her son the reverend Hortus Augustus McGarden generally have very good food when they throw parties back in the vegetable garden. We can't wait to get back there and join them. 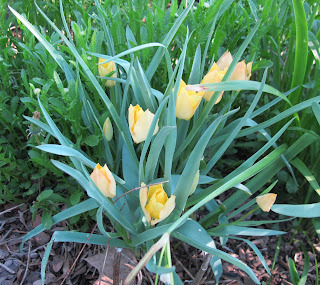 We are garden fairies and we also celebrate each and every bulb that blooms, including tulips. Most of the time the pillywiggins plan the parties for the bulbs. You have not lived until you've attended a party planned by pillywiggins. We are garden fairies, trust us on this. One other party we should mention is the one we have for flowering alliums like this one. You would just cry at how nice those parties are. 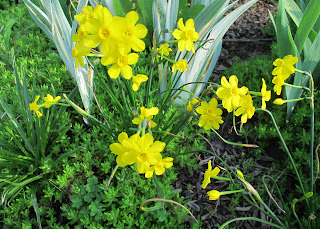 These are just a few of the flowers we garden fairies have events for. Ol' Tangle Rainbowfly says that he can't remember a better spring than this one. Sweetpea Morningdew, who co-chairs the party planning committee around here, thinks the same thing and is nearly ready to drop from the exhaustion of trying to plan and attend each and every party. I'm sure it is obvious now why we can't do Carol's work for her. She must do it herself because we are garden fairies and we have parties, celebrations, festivals, teas, luncheons, bruncheons, festivities, and other events we must plan for and attend as each flower blooms. But its her fault that we are far too busy to help her. After all, she planted all these flowers. The garden fairies are sure busy. I bet their parties are something to see! Oh, how I wish I could attend a party thrown by pillywiggins! I don't suppose you invite outsiders, Violet? I don't know if there are any fairy parties being held in my garden, but I do know I'm celebrating every new bloom, too. A belated Happy May Day to all of you and to Carol, too! Those garden fairies certainly have a busy social life. So celebratory. A lesson for us all. The garden fairies have way more fun than we gardeners do! 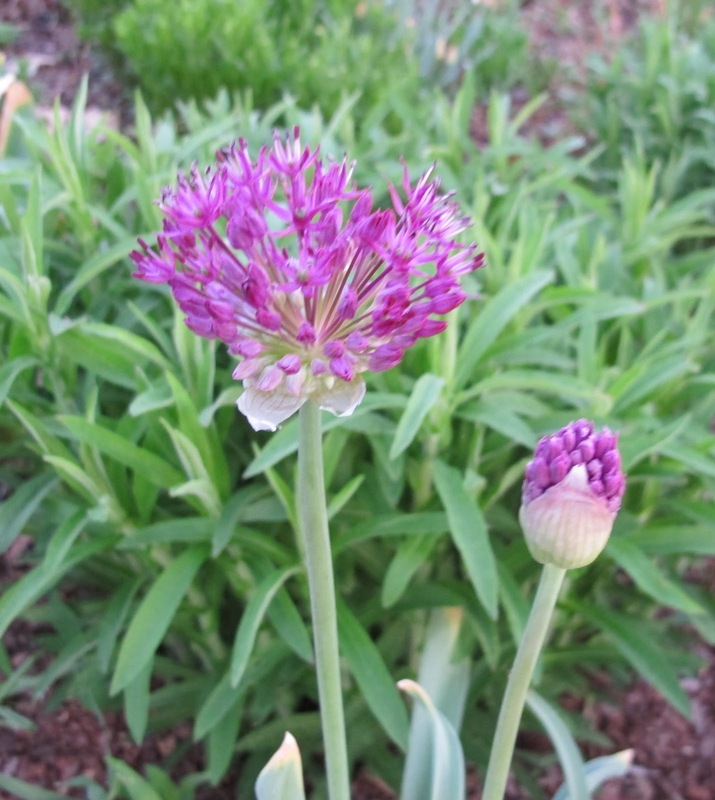 So much fun and celebration going on at May Dreams Gardens in May! Lots of good food, too. Yummy! Yes, I can see how it would be all Carol's fault . . .
Don't you just love a good party!